Antelope Audio specialise in elaborate master-clocking systems and digital audio converters, with a particular emphasis on not only minimising jitter, but using it creatively to influence the perceived audio quality in a process called 'acoustically focused clocking'. I reviewed Antelope's Orion 32 interface/converter in the June 2013 issue of Sound On Sound, and the Isochrone Clocks back in June 2010. Introduced in 2011, the Eclipse 384 is a rather complicated beast that covers a lot of bases. It incorporates a stereo A-D and dual D-A converters (at up to 384kHz sample-rates), as well as a stereo USB interface, a digital router, a monitor controller (with provision for three speakers and an integral headphone amplifier), an artist's headphone system (with talkback), and two separate internal clock chains (which are apparently on a technical par with the Iscohrone Trinity master clock). That's a heck of a lot of functionality for one 2U rack-mounting box, which explains why it weighs 8kg! The elegant styling featuresa glass strip set into a black brushed-aluminium fascia, with two stereo 32-segment bar-graph meters (which can be configured to show a variety of signal paths) and an OLED information screen. The panel controls are minimalist with just a couple of silver rotary encoders and 10 push buttons, five of which access preset setup configurations. The two rotary encoders adjust the monitor and headphone output levels via relay-switched attenuators, and a pair of quarter-inch headphone sockets completes the front-panel facilities. While the unit can be controlled to a limited degree from the front panel, full configuration is performed entirely from a bespoke software control panel (downloaded from Antelope's website, along with the latest ASIO drivers for Windows operating systems; it runs natively with OS X). 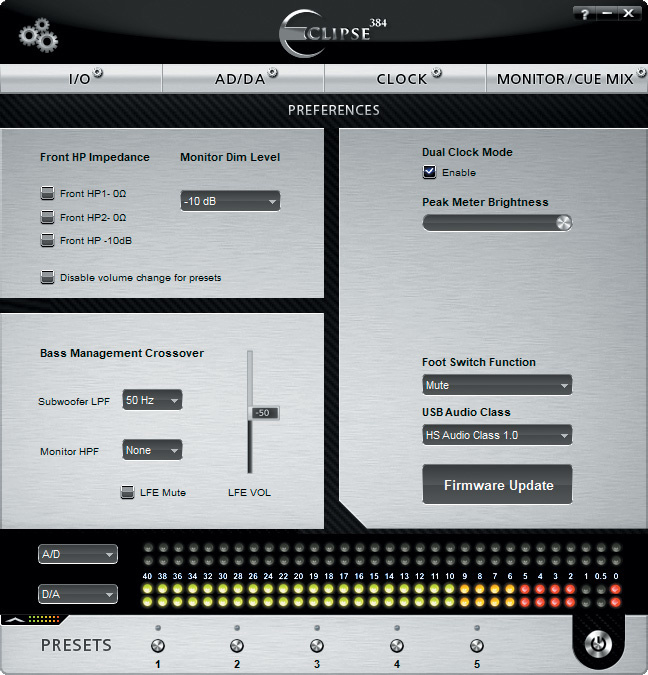 All of the Eclipse's functions can also be operated remotely from the software panel. Given the relative simplicity of the operational controls, the rear of the Eclipse comes as something of a shock: it is absolutely crammed with connectors. 'Combi' XLRs provide three balanced stereo analogue inputs, with a further seven AES and S/PDIF digital inputs on three XLRs, two RCA-phonos and two Toslink optical sockets — each with a switchable sample-rate converter to accommodate non-synchronous sources. Two more pairs of XLRs provide the analogue D-A and digital A-D outputs, while a re-clocked and 'de-jittered' version of any selected digital source is duplicated on another two XLRs, an RCA-phono and a Toslink optical socket. The USB interface is via the usual Type-B USB 2 socket. Two entirely independent internal clock systems are provided, with word-clock and 10MHz reference inputs, and four word-clock outputs — each of which can be allocated individually to either of the internal clock chains. The crammed rear panel more than hints at the versatility of this device. Unexpectedly, a pair of unbalanced TRS insert points are provided, enabling the user to break into the analogue signal path immediately prior to the A-D converter (allowing connection of a mastering processor, for example), while three stereo analogue monitor-speaker outputs (one on XLR and two on balanced TRS) are provided along with an extra XLR for a dedicated subwoofer output (mislabelled LFE). Finally, there are inputs on TRS sockets for an external talkback mic (no phantom power) and an assignable footswitch (mute, dim or talkback), plus two artist cue headphone outputs, which can be configured independently of the front-panel headphone outputs. The internal mains power supply is a universal type capable of operating on voltages between 95V and 245V AC. With such a complex, multi-faceted device it's absolutely essential to peruse the manual before attempting to operate the unit, because just getting the internal signal routing and clocking arrangements correct can take some serious thought! It would help enormously in conceiving the Eclipse's functionality and capabilities if the manual included a block diagram illustrating the internal signal-routing and clocking arrangements, too. Essentially, the signal routing for each separate functional element in the Eclipse is configured independently, but the clocking arrangements can obviously interact, and in ways that can trap the unwary, dropping occasional clicks and glitches (or more obvious aliasing distortions) depending on the nature of the setup error! So you have to think of the functionality of the unit as a whole, and not just the individual functions. Most of the detailed setting up is performed via a software control application. The control software is fairly self-explanatoryonce you understand the overall functionality, with the various parameters spread over five window tabs. The first tab, labelled I/O, allows the three analogue inputs, seven digital inputs, and three monitor speaker outputs to be allocated names to aid recognition in the other configuration menus. You can also adjust the maximum input and output levels for the analogue inputs and monitor outputs to optimise converter performance, and configure whether they are feeding balanced, unbalanced or consumer destinations. However, the software control panel (v2.03) was disappointingly flaky in that respect, with the labels and indications not accurately reflecting the actual levels and formats selected! A test oscillator is also provided, which can be routed to the various outputs to aid signal tracing and level setting, with each channel selectable between 440Hz and 1kHz. Oddly, the selection of the master clock reference (oven, 10MHz reference or external word-clock) is located here, rather than on the Clock tab! Once the I/O is configured appropriately the signal routing can be tackled via the four sections of the A-D/D-A tab. The first deals with the A-D converter's input, selectable from any of the three stereo analogue inputs or the D-A stage's output. The converter's clock source can also be selected from either clock chain, and the insert points bypassed via a tick box. In the D-A section, the converter's source can be chosen from any of the seven digital inputs, the A-D's output, or the USB replay connection. There are tick boxes to activate the line-up oscillator and mute the D-A output, and there's also an on-screen slider (scaled in decibels) to adjust the output level via a relay-switched attenuator. The third and fourth tab sections select the signal routed to the re-clocked digital outputs and the USB record feed, with the same source selection options as the D-A stage. Again, tick boxes enable the oscillator for signal tracing. The third tab configures the clocking. The Eclipse master clock defaults to the internal crystal oven at any standard sample rate, but it can also be sync'ed to an external reference (10MHz or word clock), or the digital source currently feeding the D-A, monitor section, or re-clocked digital outputs. The A and B chains can be set to any desired standard sample rate between 32 and 384 kHz (with ±4 and ±0.1 percent pull-up/down options required by the international broadcast TV industry), and a varispeed mode allows the rate to be changed by up to 200 cents (12.2 percent) in either direction. The B chain can be disabled if not required, or locked to the USB-input sample rate. Each of the four physical word-clock outputs can be assigned to output either clock chain signal. The final software tab configures the monitoring and headphone facilities. The rear-panel artist cue headphones can be fed from any of the physical analogue and digital inputs, plus the A-D, USB replay and test oscillator signals. The output level is controlled by a virtual slider (no hardware control is provided), and a tick box mutes the outputs. A second slider sets the external talkback mic input level, which is activated either by an on-screen button or a footswitch. The front-panel headphones normally follow the monitoring section source, but can be switched to duplicate the cue artist headphone, if preferred, and their output level is set either by the front-panel encoder knob or an on-screen virtual knob — both controlling a relay-switched attenuator. The headphone output impedance can be switched between 120Ω (default) and 0Ω. 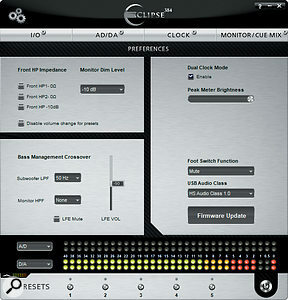 The monitoring section is provided with the full set of input-source options, and three separate output destinations. Both on-screen and hardware encoders control the relay-switched attenuator (although the on-screen versionis quite difficult to control smoothly in small increments). Various low-pass filter and mute options are provided on the setup tab for the subwoofer output, as well as independent high-pass filter settings for the main outputs. However, the selected HPF is applied to all three monitor outputs, rather than just one, and the subwoofer output is active at all times if enabled — all of which detracts massively from the usefulness of having alternative speaker switching! Tick boxes are provided for monitor mute, dim (with configurable attenuation), mono and test oscillator, with the first three also duplicated as hardware buttons. The output polarity of each channel can be inverted, and the mono mode can be selected via drop-down boxes — the latter with mono sum, stereo difference, or left/right-only modes. The Eclipse 384 is a very comprehensive and high-quality product, which is relevant to well-heeled mix and mastering engineers, but its sophistication is also its Achilles' heel. To access all the facilities it really has to be controlled via the software panel (the front panel is just too incomplete) and even then it requires a lot of clicking and switching between tabs, menus and tick boxes. The analogue and digital signal paths are beyond reproach — the Eclipse sounds as transparent as any converter I've ever used — and the technical specifications reflect that quality. I measured THD for the A-D and D-A both comfortably below 0.0008 percent, for example, and although I couldn't match the published dynamic range figures, my Audio Precision's AES17 measurements gave 121dB (A-weighted) for both the A-D and D-A converters. These are genuinely excellent figures — on a par with the best I've ever measured — but well short of the claimed 123dB (A-D) and 129dB (D-A). The Eclipse is scarily expensive, but it's an interesting product and worth careful consideration by anyone investigating high-end monitor controllers with integrated converters, or a top-quality stereo interface with artist foldback and monitor controller facilities. I'm not aware of any other product that perfectly matches the feature and functions of the Eclipse, but there are several high-end monitor controllers that incorporate reference A-D/D-A converters, such as the Crane Song Avocet, Dangerous Music ST/SR and Crookwood Monitor and Master Consoles, all of which are less expensive, but lack the master-clock facilities of the Eclipse. Mastering-grade sonics in all sections. Comprehensive converter, clocking and monitor-control facilities. Bass-management and monitor-output options poorly thought out. Software controller not the easiest to use, and some aspects could be improved. The Eclipse is a master clock, stereo interface, mastering-grade A-D/D-A converter, monitor controller and headphone amp, and artist headphone/talkback unit all in one. This makes it incredibly versatile and flexible, but also pretty complex to set up and use. The sublime sonics are matched by impressive technical performance, but the operational ergonomics are a weak link. Unity Audio +44 (0)1799 520 786.